LP Endorsers and Friends, Los Angeles CA. Two decades after I took the first LP group shot of musicians in Hollywood, California, I returned to photograph the gathering of a new generation. 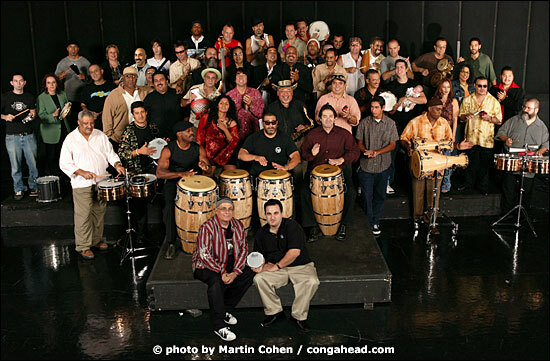 More than 50 of the finest musicians in Los Angeles arrived at Center Staging on October 5, 2004 to show their support for Latin Percussion. The LP team including Steve Nigohosian, Tom Schwarz, and Memo Acevedo traveled to California to support this effort. They worked with incredible precision and efficiency to make the two-day event a huge success. The second day of this event was devoted to recording three songs for our fourth holiday CD due out in December. Special thanks to Johnny Caswell, Nissam & the team at Center Staging; Dennis Moody and Ricky Chao Paramount Recording Studio and to all the fine musicians who gave so generously of their time to create such memorable music for the world to enjoy. To see PHOTOS from this CLICK HERE.